When someone stages one of the great Greek tragedies, we usually have to search for the reasons. How can we relate to such ancient plays, these 2,500-year-old texts, first sung and danced and chanted under a younger sun? But then, Zeusdammit, there’s Sophocles' Antigone. The ugly old world just keeps making it relevant. Antigone’s story is simple. After a civil war, Thebes chooses to bury its prince Eteocles with “all our rites” and to leave his rebellious brother Polyneices to rot where he fell. 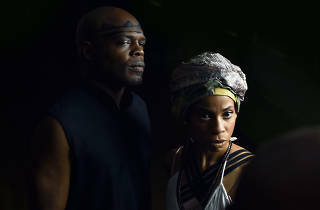 Their sister Antigone (Alexandra King) dares to sprinkle earth on Polyneices’ body, and is punished terribly for obeying decency rather than power. A boy left dead in the street, a security apparatus that sees mourning as terrorism: We don’t need the pointed design details in the Classical Theatre of Harlem’s outdoor production—the Black Lives Matter poster on Eteocles’ public shrine, the guards’ SWAT costumes—to make connections. But for all its seriousness of intent, this Antigone is not some grim, eat-your-spinach night at the classics. It is free, an hour long and a summer-evening delight. There’s dance (choreographed by Tiffany Rea-Fisher) and a superb comic turn by Anthony Vaughn Merchant as a soldier touchingly dedicated to self-care. Director Carl Cofield knows that Sophocles’ intensity will land strangely on our ears, so he sometimes redirects it into humor. 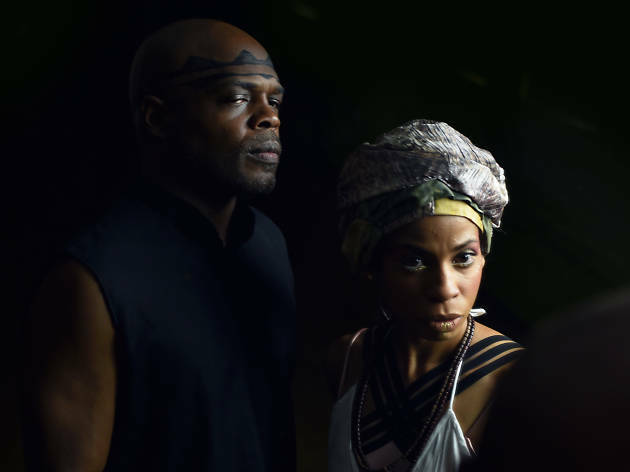 As king Creon (Ty Jones) tries to dominate Antigone, his attempts at control turn suddenly ridiculous. A tough guy ranting at a calm-faced girl always looks like an idiot. Take the note, everybody. The younger actors' performances have a crisp, flat, oratorical quality. Christopher and Justin Swader’s brilliant set replicates the water-stained concrete brutalism of state-sponsored architecture (though it’s over-animated with Katherine Freer’s busy projection design), and costumer Lex Liang does the Greek-but-modern thing with fresh invention. Jones wears a cape that should have gotten its own bow at the curtain call. And speaking of Jones: He’s extraordinary. It didn’t seem possible that he could top his powerhouse Mercutio in the CTH's 2014 Romeo n Juliet, but here he is again, the theater’s producing artistic director building a paradise in Marcus Garvey Park. His Creon shows the awful stress of power; one of his arms shakes as though he’s having a heart attack for the entire hour-long show. Everything Antigone does is right; everything Creon does is wrong. But Jones finds a way to make us spare a thought for Creon, a man trying to rebuild a city from blocks that turn to dust in his hands. Richard Rodgers Amphitheater (Off Broadway). By Sophocles. Translated by Paul Roche. Directed by Carl Cofield. With ensemble cast. Running time: 1hr 5mins. No intermission.